It is finally here. The ultimate nano-stereo Bluetooth set that will enhance your media experience like never before. It comes equipped with noise cancellation technology to filter off the external sounds so that you can enjoy your music much better. They are tiny but pack a punch. 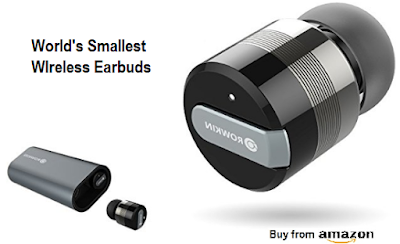 They connect to the phone or media station via Bluetooth just like the airpods only that they are smaller in size making them officially the smallest Bluetooth headsets in the market. Oh, and they are shaped like a bullet, hence the name bullet headsets. The sound quality is unparalleled since the headsets come in pairs to provide the stereo output. Both buds communicate with each other in stereo mode but you can also use it in mono or multiple connectivity mode. For instance, you can connect them to two different devices, say, listening to music from your laptop while still maintaining a connection with your phone. If the phone rings while you are listening to music, the buds will suspend the music and allow you to take the call then resume listening after the call is finished. While at it, you can use siri voice prompts for full wireless experience. Just activate siri the normal way and start controlling the phone via voice prompts. You don't even need to touch the phone. The earbuds come with a charging station, which doubles up as a holding port when not using the earphones. It also serves as a power bank for your other mobile devices. The charging station packs enough power to charge the earphones for 15 cycles and each full charge can last you three hours of continuous music or phone call. Charging takes place through magnetic induction, just like the mobile wireless charging systems. The bullet earphones are made for sport. You can take them outdoors while going for a jog or at the gym while carrying out your workouts. They have a nano film that acts as a moisture barrier, which makes the device water resistant. The winner feature of this bullet stereo headset? They can withstand water splash. Some users have reported no problem using them in the shower. Others had minor problems that were solved by simply putting it back to the charging station. Given the relatively short duration that the battery lasts on full charge, you may experience interruptions in Bluetooth connectivity. This may lead to the device making several attempts to reconnect after every disruption. Some users may not like this very much.To improve the quality of connection, always try to keep the connecting device proximal to the left ear piece. That should solve most connectivity problems. Other users have also reported the earbuds falling off the ear. They may get lost if you doze off with them in your ear in a train, for instance. To make the device compatible with most ear types, the manufacturer ships it with three different cushions that you can replace to find the right one for your ear. They have also been reported to fall off the holding/charging station when you put it in the bag or pocket. It does not come with a lid to hold them in place.